The small animal portion of our business routinely cares for cats and dogs, but our veterinarians have treated chickens, guinea pigs, chinchillas, ferrets, and pot-bellied pigs. Time and effort invested in wellness programs have many long term rewards for both pets and owners. Our wellness programs are designed to meet the specific and ever changing needs of your pet during each stage of their life. We try to educate our clients on the importance of providing the best quality of preventative care for their pets through comprehensive physical examinations; internal parasite testing; heartworm and flea control; vaccination programs, spay and neuter surgeries, specialized blood testing; weight management; pain management; and geriatric care. Immunizations: We recommend that animals receive vaccinations based on the amount of risk to which an animal will be exposed. For example, an animal that is never boarded or taken to the groomer may not need vaccinated for bordetella (kennel cough). We try to educate our clients upon the type of coverage necessary for their individual animals and the importance of administering booster vaccines to naïve animals. If you want more information, please contact our office to discuss starting a vaccine program today. Small Animal Radiology: Radiology, or x-rays, helps veterinarians evaluate musculoskeletal, cardiovascular, gastrointestinal, reproductive and urinary systems problems. Our office takes radiographs of elbows and hips for OFA certification. Isolation Hospitilization: The clinic has a small isolation room where highly contagious animals are hospitalized to decrease the transmission of disease to other animals. This room is primarily used for the hospitalization and treatment of Parvovirus cases. Pain Management: Like people, animals feel pain and discomfort. We understand that pain can inhibit them from enjoying and maintaining an active lifestyle. 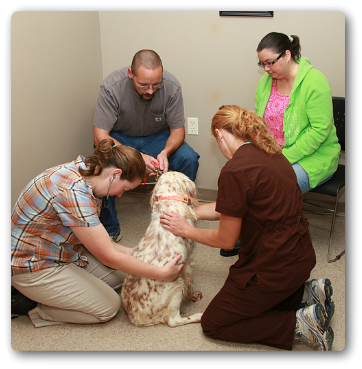 We recognize that alleviating pain in animals is essential to outstanding patient care. Health Certificates: By law, any animal traveling across state lines is required to have had a veterinarian examine and assess their health and complete a health certificate, within 30 days of travel. This is done more frequently on animals that being sold and are being transported across the country. If you plan on traveling and are unsure whether or not you are in need of a health paper, please contact our office for assistance. Microchipping: Microchips have helped reunite thousands of pets with their families. We are glad to be a part of this process and recommend placing microchips during the time of a pet’s spay or neuter.